Aeroderm is a compact model, ideal for all treatment rooms. It combines a sprayer and vacuum. Vacuum is used for vascular and oxygenating massages, as well as cleaning debris out of the follicles. The spray is ideal for spraying toners and serums onto the skin to cool and soothe the skin after treatments. 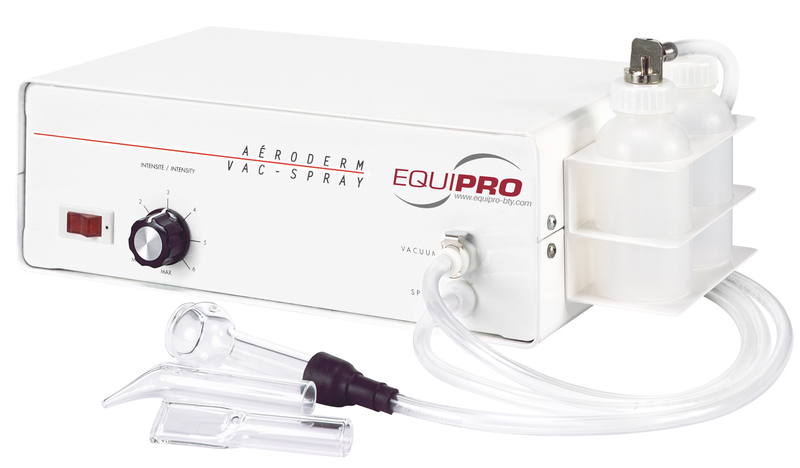 The Aeroderm 11600 is a multi-purpose tool that aids estheticians in professionally treating their clients’ skin. This compact model features a gentle, yet powerful, vacuum that helps to clear dirt and oil from the pores, as well as prepping the skin for further treatment. The vacuum stimulates blood flow to the skin, helping to improve the overall appearance. The spray jet vaporizer is used to thoroughly cleanse the skin after the pores have been vacuumed. It may also be used during the facial to help remove cleansers or exfoliation cream residue from the skin. The pulverized, fine mist better penetrates the pores. This vacuum and spray facial machine includes one anti-wrinkle, one blackhead removal and one facial massage cupping glass. Its small size takes up little space, making it ideal for small treatment rooms. Can be stacked with other Equipro devices on the Modular Equipment Column, sold separately.